Disclaimer: This website has been formed to accelerate the PennyFinding Fever. Objective: To Spread Smiles and Joy! The PennyFindings began in March 2008 (See Background). These were in direct correlation with our efforts in building our New House, and I began to tell a few people about some incredible penny findings, and they suggested I journal these discoveries. These stories became Penny Tales and soon I was reporting the daily findings to more and more people. began. After the first few CONSECUTIVE days of finding coins, this appeared to be a little more than “mere coincidence." There were forces at work which defied our earthly explanations. We logged these stories and marked them on the calendar. As major milestones arrived, the suspense grew as to how long this “finding spree” might last? Day #10: we shrugged our shoulders and said: “This is sure interesting." Approaching Day #50 we held our breath. I found a diamond next to the penny on that day as a ‘sparkling’ indication of that milestone. From Days #79-89 we traveled in Mexico wondering how we would find US coins there - we did. Day #100 we sighed in relief and danced in celebration! 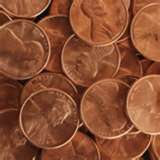 The stories from Penny Tales: 100 Consecutive Days will make you laugh, cry, and cheer on the Penny Angels. going to quit. They kept providing coins and expecting more Tales. Several factors seemed to indicate a new path. I had a 10 pound weight loss goal. It was the first day of my 10 week Weight Watchers Program. It was the first day of a 10 week term at school. Plus, I had been finding an abundance of dimes. So it seemed the Penny Angels were leading us into a New 10 Week Adventure. They were taking PennyFinding to a new level: Sharing. us to other "special projects," then the PennyFindings were minimal. Penny Pals were encouraged to make their own Promises for CHANGE. Read More Tales and See Who We Have "Spotted" while PennyFinding!